Major Publications: Preston is the author of The War Council: McGeorge Bundy, the NSC, and Vietnam. Cambridge, Mass. : Harvard University Press, 2006. He is currently writing a book on the religious influence on American war and diplomacy from the colonial era to the present, to be published by Knopf in 2012. 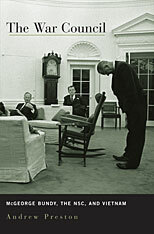 Preston is the co-editor with Fredrik Logevall of Nixon in the World: U.S. Foreign Relations, 1969-1977. New York: Oxford University Press, 2008. Preston is also the author of numerous scholarly journal articles, book chapters and reviews including among others: “Universal Nationalism: Christian America’s Response to the Years of Upheaval.” In The Shock of the Global: The 1970s in Perspective, ed. Niall Ferguson, Charles S. Maier, Erez Manela, and Daniel J. Sargent. Cambridge, Mass. : Harvard University Press, 2010: 306-318; “The Politics of Realism and Religion: Christian Responses to Bush’s New World Order.” Diplomatic History 34:1 (January 2010): 95-118; “The Deeper Roots of Faith and Foreign Policy.” International Journal 65 (Spring 2010): 451-462; “Reviving Religion in the History of American Foreign Relations.” In God and Global Order: The Power of Religion in American Foreign Policy, ed. Jonathan Chaplin and Robert Joustra. Waco, Tex. : Baylor University Press, 2010: 25-44; “The Death of a Peculiar Special Relationship: Myron Taylor and the Religious Roots of America’s Cold War.” In America’s Special Relationships: Foreign and Domestic Aspects of the Politics of Alliance, ed. John Dumbrell and Axel Schäfer. New York and London: Routledge, 2009: 202-216; “Bridging the Gap between the Sacred and the Secular in the History of American Foreign Relations,” Diplomatic History, 30:5 (November 2006): 783-812; Operation Smallbridge: Chester Ronning, the Second Indochina War, and the Challenge to the United States in Asia,” Pacific Historical Review 72:3 (August 2003): 353-390; “The Soft Hawks’ Dilemma in Vietnam: Michael V. Forrestal at the National Security Council, 1962-64,” International History Review 25:1 (March 2003): 63-95. Fox International Fellow, Yale Center for International and Area Studies, Yale University, 1999-2000. And Visiting Assistant Professor, International Relations, John M. Olin Fellow, International Security Studies, Yale University, 2005-2006. I was twenty-five years old in the spring of 1999, and just in the throes of my first intensive research trip to the United States. I was writing a dissertation on McGeorge Bundy, National Security Adviser to Kennedy and Johnson, and his role in the origins of America’s war in Vietnam. This trip was to be an extended reconnaissance mission to scope out archives in Washington, New York, Boston/Cambridge, and Austin, and lay the groundwork for a full year of research in 1999-2000. I had also lined up several interviews with many of Bundy’s former colleagues. Unlike many students of the war, I had no personal connection to Vietnam. As a Canadian born after U.S. troops withdrew in the spring of 1973, the war was a chapter in history rather than an episode from my own life. My parents had attended a protest or two in Toronto, but they were not activists, and Vietnam had never really been a part of their lives. I became fascinated by Vietnam for purely intellectual reasons, especially after reading David Halberstam’s classic The Best and the Brightest. So I was yet unacquainted with the raw emotional power the war still held over generations of Americans. One of my interviewees was Robert S. McNamara, the former Secretary of Defense and probably the best-known Vietnam policymaker. After decades of silence on the subject since leaving the Pentagon in 1968, McNamara had only recently begun granting interviews on Vietnam. In 1995, he published his memoir of the war, In Retrospect, which attracted a good deal of praise but also a firestorm of criticism. McNamara not only possessed a formidable intellect, he had also earned a reputation as a fearsome interviewee who would storm out of the room if he felt the questions-or the questioner-were political, moralistic, or just plain stupid. Despite In Retrospect-or probably because of it-McNamara was still extraordinarily sensitive about Vietnam. Indeed, I was surprised he had agreed to my interview request in the first place. Needless to say, I was extremely nervous. We met in his large, book-lined office in Washington. To break the ice, I began with what I thought was a softball. I pulled out a document I’d photocopied a few weeks before at the LBJ Library in Austin, a 1965 memo to LBJ outlining Bundy and McNamara’s reasons for advocating military escalation. I asked him to take me back to 1965 and explain the pressures they faced. To follow up, I had a series of tougher questions about why he and Bundy had not only supported escalation despite evidence-already mounting in early 1965-that it likely wouldn’t work, but also why they had so vigorously marginalized and discredited the prescient dissenters within the Kennedy and Johnson administrations. Brandishing the memo, I asked my question. McNamara looked at me blankly, and then down at the piece of paper in my hand. Narrowing his eyes, he fixed his gaze upon me again and blurted out, “Well, just read the damn thing! You’re a smart guy, you can obviously read, so just read it for yourself!” I was stunned by the rawness of his anger. I didn’t know how to respond, and his comments hovered over us in the awkward silence. But he hadn’t asked me to leave, and so I meekly suggested that it was perhaps best if I moved on to the next question. “Yes, I think you should,” he replied tersely, and we spoke for another half-hour. He relaxed a bit, as did I. But I never did ask my tough questions about the suppression on internal dissent (though they ended up forming the analytical core of my dissertation). I did, however, receive an invaluable lesson in Vietnam’s enduring resonance.